A 29-year Finnish civil servant shot a 61-year-old Russian autocrat three times with a Browning pistol on the morning of June 16, 1904. He then proceeded to shoot himself twice in the heart. 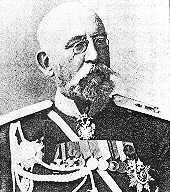 The Finnish clerk was Eugen Schauman and the Russian tyrant was the governor general of the Grand Duchy of Finland, Nikolaj Ivanovits Bobrikov. Schauman acted alone, there was no conspiracy. The murder took place on the stairway in the Senate. This political murder turned out to be one of those acts that changed history. Eugen Schauman died immediately, at 11 AM. Initially, the reaction of the Finns was subdued; because it was unclear if Bobrikov would die. As the day wore on, the Finns began filling the Helsingfors watering holes to skåla and congratulate each other. By evening, the celebrations became more jubilant, and the police started to arrest those who appeared to be happy. Jean Sibelius, who later became a famous composer, was arrested and hauled to jail, for what the police called unmotivated happiness (omotiverad glädje). Restaurant Kapellet which still serves patrons today on Esplanaden, sold champagne to an increasingly merry crowd. The restaurant at Hotell Kämp was jammed with people who eagerly listened to updates from the hospital about the situation. When the news of Bobrikovs death arrived then next day at 1 AM, the Finns met it with tremendous exaltation and more arrests were made when they hit the street in a very celebratory mood. WHY DID THE FINNS HATE BOBRIKOV? In 1904 Finland was an autonomous Grand Duchy. The nation was connected to the Russian empire only through the tsar who ruled both nations. Finnish autonomy had been challenged already during the reign of tsar Alexander III and a full scale merging of Finland into Russia was underway after Nicolas II became tsar. The Finnish legislature was ignored and Russian laws were imposed on Finland. Russian was declared to be the official language of the Senate, and Finnish military units were disbanded. Finns were now conscripted into long military service with the Russian military. The reaction of many of the potential conscripts was to avoid the Russian military service at any cost and in order to do this, many of them emigrated to the USA. The tsar Nicholas IIs chosen tool for assimilating Finland into Russia was general Nikolaj Ivanovits Bobrikov. When he was appointed to Governor -General of Finland in 1898, his goal was to eliminate the Finnish army, Finnish money, and other symbols of a nation such as the customs service. Finnish civil servants were to be replaced by Russians. Freedom of assembly was curtailed. He also began a round up of Finnish patriots who opposed his violations of the constitution by russifying Finland. These patriots were sent to exile inside Russia. Many patriots managed to escape to other countries, mainly Sweden. There was total censorship of the press. Many editors who had voiced opposition to the illegalities were also forced into exile. One of them, Eero Erkko, (who later owned Helsingin Sanomat, now the leading daily in Finland) left Finland and lived a few years in the United States. Eugen Schauman was a nobleman. A Swedish king had knighted the patriarch of the Schauman family in the late 1600s. The family had a military tradition, which carried all the way to Eugen Schaumans father, who eventually became a general. Eugen was born in the city of Harkov in Ukraine where his farther was a military official. The father was then transferred to Poland when Eugen was young. The first time Eugen was to become a permanent resident in Finland was at the age of 9 when he started school in Helsingfors. While the rest of the family continued to live in Poland, young Eugen was lodged with family members, so he could attend Nya Svenska Läroverket in Helsingfors, a private school that is nicknamed Lärkan. Unfortunately, Eugen was a poor student throughout his time in school. He suffered from an incurable hearing condition, which made his time at Lärkan very difficult. By living in Slavic countries, he had also acquired a Slavic accent that exposed him to ridicule. 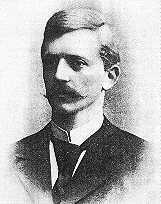 He did finish, and upon graduating from Lärkan, Eugen studied government at the University in Helsingfors. Eventually, Eugen became a clerk in the Senate. Eugen was an outdoorsman and a sportsman. He was an avid hunter who traveled long distances to hunt. He extended his hunting trips quite far from Helsingfors, all the way to Vestankvarn in Ingå where he hunted grouse. He also joined a nation wide hunters organization named Finlands Jaktförening, and became eventually the treasurer for that organization. With the Russification efforts, it was clear to Eugen that the Russians would not leave Finland unless they were forced to do so as a losing side in a revolution. Eugen wanted to use the hunters organization as a means to train the youth in the use of rifles. He even went so far as to import U.S. made Winchester 25-32 rifles, which he sold hoping to produce a militia skilled in marksmanship. He eventually realized that the Winchester was too small for military use and later promoted the Mauser rifle. Elin Borgström apparently was one lady who young men could easily become in love with. At least three men competed simultaneously for her hand in marriage. When Eugen proposed to Elin on Oct. 24 1903, she responded with the word aldrig, Swedish word for never. After that date, everything pointed to Eugen planning to kill himself after shooting Bobrikov. Eugen arranged with a friend to send flowers to Elin on her next three birthdays. He had written the cards and envelopes that were to be attached to the flowers. The first two cards were addressed to Elin Borgström. The third card was addressed to Elin Florin. Eugens prediction that Elin would marry Einar Florin was accurate, but when the flowers arrived, she was still Miss Borgström. They married four months later. The Russians originally paced Schauman's body in an unmarked grave. After Russian opposition to a marker had subsided, Finnish college students collected funds for an impressive monument for Schauman's grave in Borgå. HOW DID EUGEN SCHAUMAN CHANGE HISTORY? The Russification of Finland was temporarily slowed because the new governor general was much less aggressive. The Russians also got second thoughts of the wisdom to take Finnish conscripts to the Russian military. The Russians realized, that training Finns in military skills would be like training a guerilla which eventually could be turning against the Russians. The conscription of Finnish men to the Russian army ended the following year. The elimination of the conscription saved thousands of Finnish lives in WW I, because the only Finns involved in that destructive war were volunteers. The murder of the hated Bobrikov gave the Finns courage. The Finns stiffened their opposition to russification. An activist movement was strengthened. A nation that had suffered oppression now had confidence. The steps toward independence did, in fact, closely mirror Schaumans plans. Military training took place in secrecy, just as Eugen had planned, not only in hunting clubs, but also under the guise of fire companies and gymnastic clubs. At the 100th anniversary of the murder of Bobrikov, the Prime Minister of Finland, Matti Vanhanen, showed his ignorance of history by declaring Schaumans act as terrorism.